For decades, piano teachers have forced their students to work through music theory books but have never made the connection between theory and the actual music that the student plays. As a result, most pianists see theory as useless knowledge, inapplicable to the music they play every day. The truth is exactly the opposite. Theory is absolutely vital to understand if you want to be a good improvising pianist. It provides the framework from which improvising can take place. The good news is that you don’t have to know ALL music theory to be a good improviser. In fact, you simply need to know a small subset of it. That subset is what is covered in this course. In other words, this course is not about trivia; it is rather about practical information that will help you play better in church. A 37-page study guide with illustrations and assignments is included. What order should you take the courses in? Pay on your own schedule! If you purchase and want to return this product, you are welcome to do so within 90 days of the purchase date. We have yet to see our first return! How is this course different from all the rest on the market? It is different in one very significant way. It is based on understanding harmony. There are methods for teaching congregational accompaniment that do not focus on harmony. While you may initially learn quicker using those methods, you will limit your long term potential. 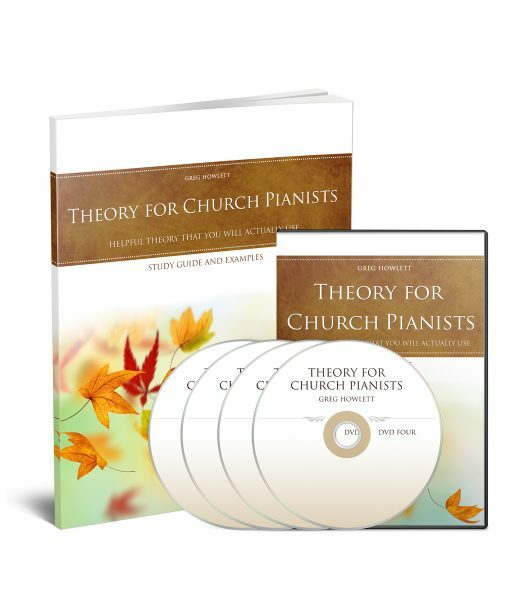 What kind of church music will the concepts work with? You can use these concepts with any music. In the DVDs, the concepts are demonstrated with simple hymns, but you can use them with practically any modern music. Do I have to wait for this course to arrive by mail or can I view it online? You can order and take the electronic version of this course. You simply need a DSL or similar internet connection. When you order, you will receive the study guide in PDF format and will be able to view/download the course as much as you want. This option will save you money and is especially effective if you have a laptop but no TV in the same room as your piano.